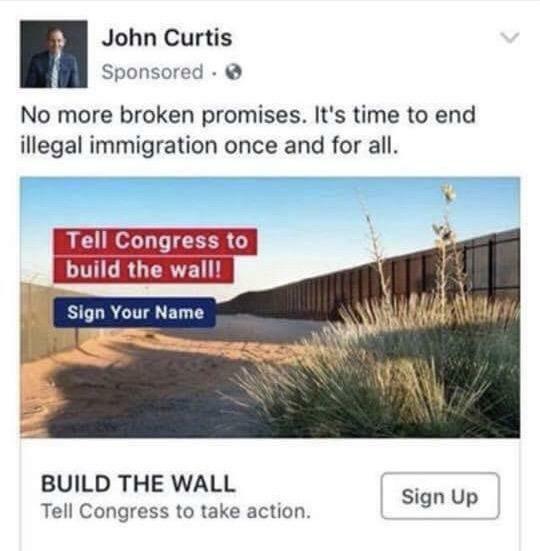 The ad appeared over the weekend and urged people to sign a petition to build a wall along the U.S. border with Mexico. The ad turned off voters like Janely Martinez, who’s the child of Cuban immigrants. She changed her party affiliation so she could vote for Curtis in the closed Republican primary. “I reached across the aisle and I voted for someone that I thought I could trust. I voted for someone that I thought was going to bring us together,” Martinez said. Martinez said she no longer trusts Curtis and there’s no way she’ll cast a vote for him in November. Curtis’ two major opponents in the special election for the seat vacated by Jason Chaffetz have seized on the controversy. John Curtis' campaign did not return a request for comment, but he addressed the pushback in a lengthy statement on Facebook. Curtis said his team underestimated how contentious the wall is. He added that securing the border with Mexico should be a top priority, and if the wall is the best way to protect the country, he will support its construction.